Looking to boost your Hearthstone collection? Hearthstone is adding a special limited-time bundle that offers 30 card packs for half the current rate, along with a special quest that rewards four more card packs for free. Winter Veil is Blizzard's annual holiday celebrated across the annals of Azeroth. And as is the case every year, Hearthstone is getting in on the action. This year will offer a new bundle that offers up discounted card packs, along with a few ways to get some free packs. 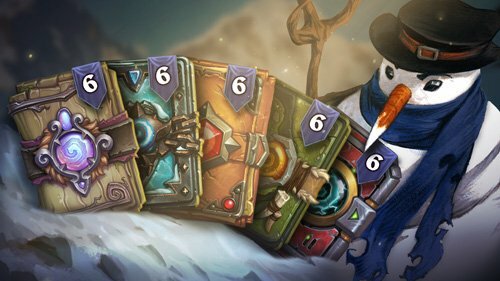 The Winter Veil Wonder Bundle is here to celebrate the Hearthstone Standard year, which is rapidly approaching its conclusion. This will offer six card packs from each of the most recent five expansions prior to Rastakhan's Rumble: Journey to Un'Goro, Knights of the Frozen Throne, Kobolds & Catacombs, The Witchwood, and The Boomsday Project. That totals up to 30 card packs for $19.99, which is more than the 15 card packs that the same price would usually net players. The Winter Veil Wonder Bundle is only available until Monday, December 31, so don't look for it beyond the new year. Those looking to avoid spending money for the holidays can also pick up some free card packs, thanks to a special daily quest. The "Happy Winter Veil!" quest will tasks players with simply playing 100 cards, either in Casual/Ranked play, Arena, or Tavern Brawl. Doing so will reward four free card packs from The Boomsday Project. Speaking of Tavern Brawls, there are special holiday-themed brawls ahead. The first one is set to kick off this Wednesday, December 19. Titled "Returns & Exchanges," players are tasked with building a deck of 20 minions. The remainder of their deck will be filled with 10 random spells from their class. After getting their opening hand, the player will gift the remainder of their deck to their opponent. The deck will also include a 5-Cost Gift Receipt card, which can be used to re-exchange the decks and also destroy the opponent's Gift Receipt. In lieu of the usual Classic card pack, winning this Tavern Brawl will reward players with the Winter Veil Treat card back. Next week's Tavern Brawl will see the annual Gift Exchange make its return. Greatfather Winter drops crates onto the battlefield, with the object being to smash those crates open for a special Discover effect. It's a twist on the classic Tavern Brawl of the last couple of years, only with a handful of new expansion cards to mix things up. Find more information on this year's Winter Veil festivities on the Hearthstone website. For more on Hearthstone's more recent expansion, Rastakhan's Rumble, be sure to revisit our complete Rastakhan's Rumble coverage.